Yesterday, we sent Monica and her daughter off to watch Operation Ouch! Live on Stage at Arts Centre Melbourne! 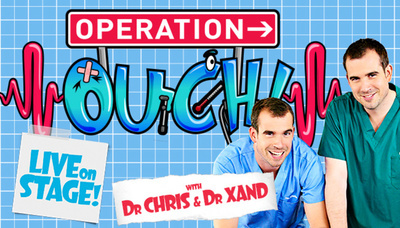 Today Miss 6 and I were lucky enough to go and see Dr Chris and Dr Xand from ABC3s 'Operation Ouch' live on stage. We were a little unsure as to how they would bring the TV show to life, however their expert knowledge of 'all gross bodily functions' was displayed through experiments, excerpts from the show and fascinating live camera footage of Dr Xand's eardrum and up his nose! Highlights from the show include seeing a real cow's lung inflated with oxygen (or was it fart gas as labelled? ), the manipulation of a chicken's foot by pulling tendons and the interesting and kid friendly information presented on the spread of disease. Throughout the show Dr Chris and Dr Xand interacted with the audience and a number of children were lucky enough to go on stage or ask questions to the knowledgeable doctors. 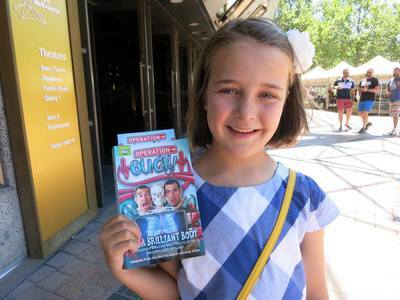 Miss 6 was thoroughly engaged throughout the show and spent much of the time with her hands to her face- giggling behind her hands in delight at the endless fart and bodily fluid jokes or shielding her eyes from some of the 'gross' or 'cray-cray' scenes. After the show we bought the 'Operation Ouch- Your brilliant body' book and Miss 6 couldn't wait to get stuck into it on the way home! Operation Ouch! Live get's a big thumbs up from KidTown Melbourne! The Operation Ouch! Live Melbourne tour has now finished, but if you'd like to keep up to date with future dates, head to www.operationouchliveonstage.com.